Head of state: President Pranab Mukherjee (since 22 July 2012). Head of government: Prime Minister Narendra Modi (since 26 May 2014). Form of government: Centre-right coalition government of the National Democratic Alliance (NDA), led by the Bharatiya Janata Party (BJP). In the April/May 2014 general elections the opposition BJP gained a landslide victory by winning an absolute majority in parliament (282 of the 543 seats lower house): the first time since 1984 that any party has won a majority. The former coalition government of the United Progressive Alliance (UPA) suffered a major defeat, with the Congress Party gaining only 44 seats (206 seats after the 2009 general elections). Ahead of the elections, the UPA government struggled with widespread public dissatisfaction with high inflation and slowing growth. Several massive corruption scandals eroded the coalition’s power and cohesion, hampering parliamentary processes and progress since 2010, and impeding necessary economic reforms. In contrast, the BJP front runner Narendra Modi had built a strong reputation as a competent administrator and economic reformer during his time as chief minister of the state of Gujarat. Modi was also favoured by international financial markets. Despite several violent conflicts (tensions between Hindus and Moslems in Kashmir, and more than 20,000 Naxalites- Maoist rebels active in the rural areas of several central and eastern states) India as a whole is still regarded as a fairly stable nation. Prime Minister Narendra Modi raised expectations for an improvement in relations with Pakistan when he invited Pakistani Prime Minister Nawaz Sharif to his inauguration in May 2014. However, in August Modi called off peace talks because Pakistan planned to meet with Kashmiri separatists. Overall relations remain strained and may well deteriorate again. Relations with China remain sensitive, despite an agreement on defence cooperation along the disputed border (the two countries disagree over certain Himalayan border areas). However, economic ties are improving. After decades of rather lukewarm relations with the US, Washington now considers India a strategic partner and potential counterbalance to China’s rising power in Asia. 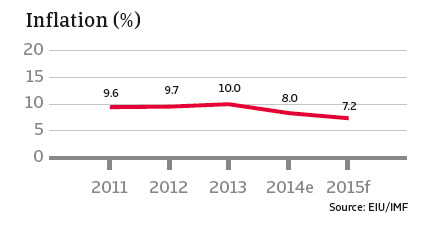 Economic growth has slowed markedly since 2011 after high growth rates - above 8% - were recorded in 2009 and 2010. 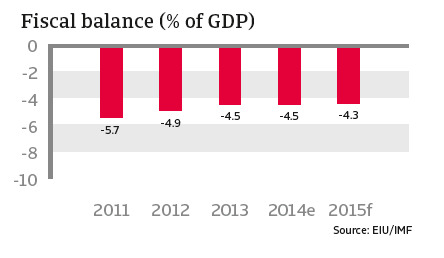 In 2013 GDP increased 5% year-on-year. Since the long-term potential annual growth rate is estimated to be 9%, this is quite disappointing. The main reason is India’s poor track record on structural economic reform: failures in both infrastructure and education, cumbersome ‘red tape’ and an ineffective legal system are among the factors that conspire to create the country’s inadequate business environment. In recent years, stubbornly high inflation of more than 9% and high interest rates deterred both consumer demand and investment. High consumer prices are a serious concern in India, under mining the purchasing power of the many poorer households: according to the World Bank, more than three quarters of the population still live on less than USD 2 a day. That said, inflation began to decrease during 2014 and is expected to fall further in 2015, to around 7%, helped by decreasing global commodity (oil) prices. Additionally, in September 2013 the internationally renowned economist Raghuram Rajan became head of the Reserve Bank of India (RBI), and identified lower inflation as his major target. Since then the key short-term interest rate (repo rate) has increased three times to its current 8%, and the RBI is informally targeting a 6% inflation rate by January 2016. Rajan has held discussions with the government to adopt a new policy framework that will probably include a formal inflation target and rate-setting committee. As a result of the new monetary framework inflation is expected to decrease to 6% per annum in the medium term. Rajan has also announced far-reaching reforms of the financial sector, including making it easier to open new bank branches in order to provide finance to the poor, small businesses and remote rural areas. India’s real economic growth is expected to have increased 6.0% in 2014 and to reach 6.5% in 2015. It is anticipated that the rebound will be driven by the resumption of stalled infrastructure projects and in the medium term, boosted by the growing middle class, high investment, urbanisation and improvement of the business environment and more structural reforms. 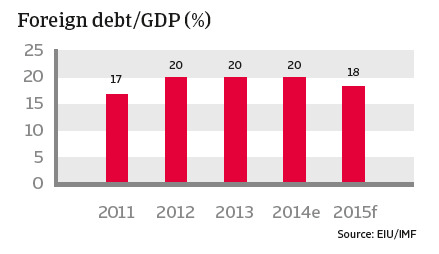 India’s public debt has traditionally been quite high but has declined significantly over the past couple of years. It currently stands at 50% of GDP and is largely domestically financed. The central budget deficit is 4.5% of GDP for 2014 but the total deficit, including those of the federal states, amounts to around 10% of GDP. The main reasons are the low tax base and high expenditure on subsidies for fuel, food and fertilizer. However, these deficits can be financed by domestic borrowing. The Indian corporate sector suffers from an overhang of debt: the average debt/equity ratio of Indian non-financial companies is 87%: the highest of all emerging markets. While this is largely domestic debt, the Indian banking sector, which was still a net creditor in 2006, currently has external obligations of more than USD 150 billion. As approximately 4% of Indian bank loans are non-performing, the concern is that banks will not be able or willing to fund fresh investment by businesses, and this would hamper higher economic growth rates. India has many structural deficiencies: underdevelopment of the agricultural sector, poor infrastructure, inflexible labour laws, excessive bureaucracy, rigid land laws (Land Acquisition Act), and a shortage of skilled labour due to the poor education of most of the population. All these factors are barriers to foreign investment and higher growth. Despite some subsidy cuts and foreign investment liberalisation laws passed in late 2013, structural reform measures by the former Congress Party-led government remained too slow, due to the lack of a parliamentary majority and strong anti-reform forces within the Congress Party itself. With the more free market and business friendly stance of the BJP, the expectations for the new Modi administration are high and, given the BJP majority in parliament, the chances of passing reforms are better than ever. So far, the Modi government has reduced diesel fuel subsidies and planned measures to improve India´s slow and clumsy bureaucracy, which has hampered many investment decisions in the past. The administration announced structural reforms of the labour market (complex labour regulations have repeatedly been criticised by investors) and the financial sector (e.g. opening up the insurance industry to greater foreign participation), faster environmental approvals for major investment projects, fewer foreign investment curbs and steps toward ending the state’s grip on commercial coal mining by making bidding processes more transparent. However, there is no firm timetable for a national goods-and-services tax, which would boost GDP substantially by removing barriers to trade between India’s many states. There are still limits on foreign direct investment in many areas, including retail, while the privatisation of state owned enterprises has yet to be included in the reform agenda. India is the world’s largest producer of coal, which provides more than 50% of its energy consumption. 66% of its oil and gas is imported. Electricity supply is highly unreliable: a major impediment to the economy. The high dependence on oil imports and the high associated subsidies are the Achilles´ heel of the Indian economy. However, the decrease in oil prices is helping, especially as it reduces inflation and decreases the current account deficit. In months of imports (cif): Comfortable: 8 months of import cover in 2014. India remains a relatively closed economy (exports of goods and services amount to only 26% of GDP). Trade balance deficits are largely countered by surpluses on the service and transfer accounts. Foreign capital inflows consist mainly of portfolio investment and bank loans. 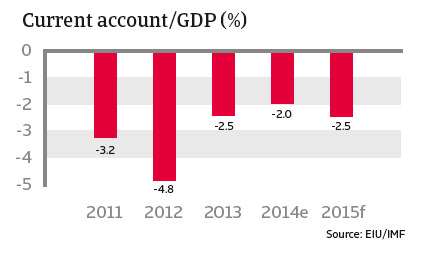 India´s country and sovereign risk remain low, since foreign debt amounts to only 20% of GDP, the liquidity situation is comfortable and the current account deficits are quite small. In 2013 India, like some other emerging markets, became susceptible to the reaction of international investors to the anticipated ‘tapering’ by the US Federal Reserve (i.e. a reduction of its quantitative easing programme). A reversal of foreign capital flows resulted in a sharp depreciation of the Indian rupee and a deterioration in share prices. However, in 2014 India won back the confidence of the international financial markets and depreciation of the rupee halted. 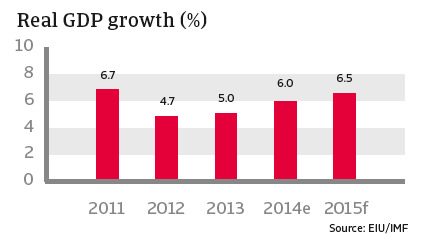 In 2015, economic growth is expected to increase again: to 6.5%. However, this is still far below the 9% regarded as the long-term potential growth rate. Unless the government does its part by adopting more radical reforms, a return to the 9% annual growth rate that India briefly enjoyed before the financial crisis is hard to imagine. So far, the Modi administration has imposed only incremental reforms. It has shied away from major steps such as a reduction of fuel, food and fertilizer subsidies, which together account for a third of India’s fiscal deficit, but would be a highly sensitive - and unpopular – issue. Nevertheless, compared to its predecessors, the new government does seem to be more reform-minded, and that in itself is progress. Despite its shortcomings, India is a large market with high growth potential. With a growing middle class population of around 70 to 100 million creating demand for consumer goods and opportunities for domestic and foreign investment, this is still a market that many international companies cannot afford to ignore.